A textured eraser can have the same settings as a textured brush: It can have a bitmap tip of any shape, can be hard or soft, semi-transparent, combine two tips and be applied with a paper texture effect. When working on a bitmap layer, the eraser tool is always textured, whereas when working on vector layers, erasers are solid vector by default. A solid vector eraser merely cuts out the shape of the eraser stroke from the vector artwork, whereas a textured vector eraser makes the artwork's bitmap texture more opaque or fully invisible, depending on its intensity, then cuts out some of the vector artwork that the eraser made fully invisible. A textured eraser works like a reverse textured brush: It makes the pixels in a brush stroke's texture more—or completely—transparent, depending on the eraser's intensity. This effect can only be obtained by using a textured eraser on a textured brush stroke. If you use a textured eraser on solid vector shapes or on pencil lines, the eraser will act like a solid vector eraser, that is, it will merely cut out the shape of the stroke from the artwork. This is because solid vector shapes and pencil lines don't have a bitmap texture, and therefore the textured eraser cannot work on the opacity of their individual pixels. Hence, when working on vector layers, it is better to use a textured eraser only if all your artwork is composed of textured brush strokes, or it might wield strange-looking results. This outlines one of the advantages of working with bitmap layers. On bitmap layers, your brushes and erasers always work as textured brushes and erasers. Another issue you might encounter when erasing textured vector artwork is that textured vector brush strokes are not flattened together, whereas on bitmap layers, your artwork is always flattened. This implies that if you use a semi-transparent eraser on textured vector artwork, and the artwork has overlapping strokes, all the strokes you erase will become semi-transparent, the resulting image will be a composite of the overlapping strokes. On a bitmap layer, this would simply result in a single layer of semi-transparent artwork. There are two different types of textured vector erasers: Textured and Textured, Preserve Vector. A simple textured eraser will do two things: First, it will make textured brush strokes more or completely transparent where you erased, and second, it will cut out from the brush stroke's vector shape where it made its texture completely transparent. 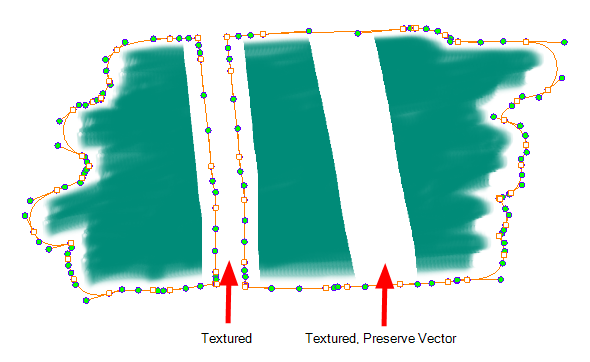 In contrast, a Textured, Preserve Vector-type eraser will only make the texture brush strokes more or fully transparent, but will leave its vector shape intact. Creating a textured eraser works exactly like creating a textured brush. Therefore, you can follow the steps in the Creating a Textured Brush section to learn how to create a textured eraser.